Parcelforce is one of the UK’s main courier and logistics services, delivering tens of millions of parcels all over the world each year. It is primarily used for business and commercial purposes, with businesses finding it more cost effective and efficient to send stock and consignments to trade customers and other companies via the Parcelforce delivery service, though in recent years the number of individuals opting to use Parcelforce to fulfil their delivery needs has increased significantly. A tracking number is provided to the seller once a consignment has been confirmed, and the number can then be used to track the package through its journey. Both the sender and the recipient are able to follow its progress through entering the code into the Parcelforce online Track and Trace system. Once delivery has been successful, the tracking details will indicate the time and location of delivery, along with showing a viewable electronic signature taken on delivery. This ensures that the sender is fully protected and that any false claims regarding non-receipt cannot be made. Anyone can access the tracking information if provided with the long number, so selling websites such as eBay will accept it as proof of posting and delivery. There is no way of tracking a parcel without the number, so keeping it safe is essential. Every package sent within the UK through Parcelforce can be tracked, as can most international shipments with the exception of those sent using the globalvalue or globaleconomy services. Some packages sent to countries that do not have sufficient tracing infrastructure are not able to be tracked by non-account members online, with very limited information provided to account members using gloalexpress. Countries exempt from tracking include Bangladesh, Central African Republic, Congo, Gabon and the Falkland Island. A full list with further details on parcel tracking by country is available on their website. Parcels are delivered until 5.30pm Monday to Friday, with Saturday deliveries only taking place when the customer has paid additional costs for it. A redelivery service is available for missed deliveries, where the recipient can arrange for safe delivery of their package to be attempted a further three times before being sent back to the depot, where they can collect it in person with appropriate identification. Parcelforce Worldwide is not liable for any consignment that is delivered to the delivery address or other address, nor in cases where a person misrepresents themselves as the recipient, or when they have fully adhered to the instructions given on the instructions form filled out by the sender or recipient. The company is part of the Royal Mail Group, and was founded in 1990 when the Royal Mail was divided into three different sections, with Royal Mail Parcels being re-branded as Parcelforce. It experienced quick and considerable growth, before long becoming one of the world’s most respected and reputable names within the postal service industry. In 2002, it became its own company and began to focus on express and timed delivery services, leaving the universal parcel service in the hands of the Royal Mail in order to do so. Parcelforce Worldwide has experienced continued growth since, with two huge hubs in the UK which process around 58,000 parcels on an hourly basis, totalling 40 million in an average year, as well as 53 local depots. At the end of 2012 it was announced that, following a £75 million investment from the Royal Mail Group, Parcelforce would be opening three new processing centres across the country, further strengthening the brand and enhancing the services on offer. Parcelforce Worldwide now has over 30,000 of its own customers in the UK, and their special deals and discounts for businesses, along with the reliable express services available, make them one of the go-to delivery companies for those in the commercial sector. It was awarded several times for its service, including the Institute of Transport Management’s Best International Parcel Carrier 2012 award. Despite dividing from the company in terms of services, it is still part of the Royal Mail Group Ltd, which has an annual turnover of £8.4 billion. Parcelforce also holds a strong position in the UK’s top five express carrier businesses, a highly competitive industry. It has access to the world’s largest delivery network covering 240 countries and territories worldwide, meaning that it is able to deliver to 99.6% of the world’s population. It works with several partners to ensure efficient and reliable coverage in Europe and the rest of the world, including GLS, a road-based European network that specialises in guaranteeing delivery on specific days, the Express Mail Service (EMS), who enable them to take their services all over the world and support their global priority service, as well as E Parcel Group (EPG), who also deal with day certain European deliveries. UK and International parcel services can be arranged and paid for online via the Parcelforce website. This is a quick process, especially for existing account holders. Before purchasing services, the sender needs to have some information handy, for example the dimensions, weight and contents of the parcel they are sending, whether they require the parcel to be collected or if they would prefer to drop it off at one of the listed depots, and whether the recipient would prefer to have the package delivered to them directly, or to their local depot or branch where they can collect it on a date that is convenient for them and at their preferred time. For domestic shipments within the UK, timed next day, next day and 2 day services can be purchased online, and for international parcels sent worldwide, express, priority and economy options are available. Payment can be made by credit or debit card, with Visa, American Express, Delta and MasterCard accepted, or by entering the meter impression number of a company’s franking machine. Parcelforce’s UK and international delivery prices change regularly. As of March 2014, the prices are as follows. Additional weight is charged at £1.25 per kg for all services. Addresses in the Channel Islands are classified as international destinations by Parcelforce Worldwide. Additional weight is charged at £2.30 per 0.5kg for global express, and 0.25p per 0.5kg for globalpriority and global value services. Additional weight is charged at £1.40 per 0.5kg for global express, 0.55p per 0.5kg for globalpriority and global value, and £1.25 for irelandexpress services. Additional weight is charged at £1.40 per 0.5kg for global express and 0.55p per 0.5kg for globalpriority and global value services. Additional weight is charged at £1.65 per 0.5kg for global express and 0.55p per 0.5kg for globalpriority and global value services. Additional weight is charged at £2.25 per 0.5kg for global express and 0.55p per 0.5kg for globalpriority and global value services. Additional weight is charged at £3.05 per 0.5kg for global express, 0.95p per 0.5kg for globalpriority and £1.00 for global value services. Additional weight is charged at £3.66 per 0.5kg for global express, £1.14 per 0.5kg for globalpriority and £1.20 for global value services. Additional weight is charged at £3.10 per 0.5kg for global express, £2.30 per 0.5kg for globalpriority, £2.15 for global value and £2.35 for globaleconomy services. Additional weight is charged at £4.95 per 0.5kg for global express, £3.45 per 0.5kg for globalpriority, £3.30 for global value and £3.20 for globaleconomy services. Additional weight is charged at £6.60 per 0.5kg for global express, £4.95 per 0.5kg for globalpriority, £4.45 for global value and £3.85 for globaleconomy services. Additional compensation of up to £2,500 is available, priced at £1.80 (including VAT) for the first additional £100 cover and £4.50 (including VAT) for every subsequent £100 cover on express9, 10 AM, express24, express48 and BFPO Worldwide, globalexpress, irelandexpress, globalpriority and globalvalue services. The maximum compensation available for globalvalue is £500, and no compensation is included, nor can it be purchased, for globaleconomy consignments. Saturday deliveries are only available within Zones 1, 2 and 3 in the UK, and can be requested on express9, express10, expressAM, express24 and express48 services for an additional £7.50 (excluding VAT). Parcelforce runs its collection and delivery services using 53 strategically located depots, where customers that have missed deliveries can go to deliver packages to save waiting for a delivery driver to come and collect if from their residential address or business premises, collect their packages or make enquiries in person. Depot locations include Aberdeen, Aldershot, Cambridge, Exeter, Birmingham, Belfast, Deeside, Coventry, Edinburgh, Leeds, Ipswich, Preston, Glasgow, Liverpool, Milton Keynes, Norwich, Poole, Nottingham, Romford, Stoke, Swansea, York, Medway, Newport, Oxford, Plymouth and Tonbridge. There are several depots located in London serving different regions, with a London Central Depot and London North West Depot. To find the nearest depot, customers can utilise the depot finder by entering either the beginning or their full postcode. 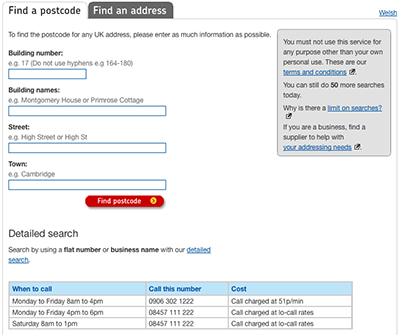 On submitting the postcode data, the nearest depot address, contact number and full opening hours will be available along with a useful map detailing its exact location, giving precise distance from the specified postcode, and giving an approximate time of how long it will take to get there. With the help of their business partners, Parcelforce are now able to offer their services and deliver across the globe, with next day services to most destinations available through globalexpress. Customers can look up delivery speed estimates for specific countries in the Worldwide Directory, a particularly useful service for those sending urgent packages abroad. The Parcelforce national hub, which acts as a highly efficient tracking and sorting centre, is located in the Midlands, where it handles national parcels delivered via the 53 Parcelforce depots located all over the UK. The quarter of a mile long, high performance hub, formally referred to as The National Centre, is equipped with the automated technology and expertly trained workforce to process up to 58,500 parcels per hour, with in excess of 35 million being processed on a yearly basis. At the busiest times, the staff take-on a fully loaded delivery vehicle every 45 seconds. Parcelforce offer many compensation, refunds and claim opportunities when they fail to provide their usual service, damage or lose items or packages in transit, or if customers are in any way dissatisfied with the level of service they have received. A certain degree of compensation is included in the initial cost of the parcel service, and enhanced compensation, which covers more expensive goods and provides added protection and security, is offered at an additional cost. With the exception of their global economy shipping option, all of Parcelforce’s delivery services come with compensation included, which entitles the customer to claim a certain amount of money in the event that a parcel is lost or subject to damage during transit. It should be noted that only the actual cost of the parcel and its contents can be reimbursed via claims made through inclusive compensation, and that indirect or consequential loss and costs encountered as a result of the loss or damage, such as extra labour or lost profits, are not covered. £200 of compensation per consignment is automatically included in the price paid for express9, express10, expressAM, irelandexpress and globalexpress services, £100 for express24, express48 (non account only), express48large (non account only), europrioritybusiness, europriorityhome, globalpriorityreturn (account only), globalpriority, globalvalue (non account only), expresscollect, £50 for express48 (account only), express48large (account only) and globalvalue (account only), and £25 per parcel for globalbulkdirect. Additional compensation can be taken out at the time of sending packages at extra cost to the customer. This is a popular option for businesses who are using the company to send valuable stock and need that extra bit of reassurance, as well as individual customers who are sending expensive gifts and items. Enhanced compensation covers up to £2,500 on packages lost or damaged, regardless of how much the item in question is valued at. Compensation granted via the enhanced compensation guarantee will depend on several factors, for example how much damage has been done, existing wear and tear and the perceived value of the item. The eventual amount will be determined by the lowest cost or sale price, and in many cases items will be replaced by an independent agent employed by Parcelforce rather than the customer being given a cash reimbursement. General customers are able to purchase cover for ad hoc consignments, while account customers have access to a compensation service that covers their entire contract, paying a small additional cost per extra consignment. Account customers have the choice of five levels of compensation, with the additional cost rising with the compensation amount. Level 1 compensation, covering up to £500, is £4 +VAT, and Level 5 compensation, covering up to £2,500, is £20 + VAT. For non account customers, additional compensation is priced at £1.80 including VAT for the first extra £100 cover and £4.50 including VAT for every subsequent £100, and covers express9, express10, expressAM, express24, express48, express48large, globalexpress, irelandexpress, globalpriority, globalvalue and HM Forces – BFPO services. Full of partial refunds are granted when the company fails to deliver a parcel in the time promised, with 100% being refunded on express9, express10, expressAM, irelandexpress and globalexpress services, 50% on express24 services and 25% on express48, express48large and globalpriority services. Refunds are not granted for late HM Forces, globalvalue, globaleconomy deliveries. Terms and conditions illustrating where these refund guarantees do not apply are set out in their delivery speed guarantee exceptions. Claims must be received within 30 days of dispatch to qualify for compensation. All the documentation relating to the parcel is required to make a claim, and in cases where damage has occurred, the packaging material in question must be presented so that it can be inspected by a member of the claims staff. Several items are excluded from claims against loss or damage, and customers should be aware of these before sending anything via Parcelforce services. Excluded items include dangerous, prohibited or restricted goods (where customers do not comply with the relevant terms and conditions), or goods breaching sanctions, such as money, antiques that are over 100 years old, watches and diamonds. Fragile items, such as furniture, cakes, televisions, glassware, vehicle parts and computer monitors, qualify for loss only, and are otherwise sent at the risk of the customer. To qualify for the compensation, customers must ensure that packages are adequately packaged on sending, so that it falls in accordance with the guidelines set out by Parcelforce. These guidelines include instructions on wrapping, sealing and securing the package itself, as well as strict rules on clear labelling and correct documentation on the box in order for it to be safely delivered to the recipient without confusion or difficulty. Packages that do not adhere to the guidelines are deemed to be the customer’s responsibility and no compensation will be granted should damage or loss occur. Packaging guidelines can be read in full on their website. All claims for damage or loss must be received within 30 days of posting except globalexpress ,which must be received within 15 days. express24 is the next day delivery service offered by Parcelforce, guaranteeing delivery within 24 hours of shipping a consignment. express48 is Parcelforce’s 48 hour parcel delivery service available for shipments within the UK. This special service is second fast that is available and comes with tracking48 service. You can track this parcel always online, to find its current location. Tracking48 is not a particular option as such and refers to the tracking abilities of the express48 service. Both services guarantees delivery within two working days and are fully trackable from the time the package is delivered and while it is in transit right up until delivery, where the delivery driver will obtain the recipients electronic signature before handing over the parcel. This signature will then be viewable to the sender for reassurance and tracking purposes. There are various terms, requirements and limitations for using the express services, which customers must adhere to and should be aware of being purchasing. Individual parcels are limited to 30 kg, though there is no limit on how much an entire consignment sent using express48 could weigh. The maximum parcel length is 1.5 m, with limitations of 3 m maximum length and girth combined. £100 compensation is included in the price advertised, with a maximum of £2,500 extra compensation available at additional cost. If the package is not delivered within the promised 1 or 2 days, a 25% refund will be granted for express48, with 50% being refunded for express24. Saturday delivery is available, though at extra cost, which is charged per consignment. For items exceeding the specified weight and dimensions, the express48large service is available. This gives an increased dimension allowance of 2.5 m in length and 5 m length and girth combined, and is particularly handy for businesses sending commercial consignments. Parcelforce have many jobs and secure long-term careers within the company available throughout the UK. Roles within the company are multi faceted and diverse, with many opportunities available to suit all kinds of skill-sets and abilities. The company currently employs over 200,000 people, and has a strong customer focused ethos, with its dedicated workforce working together every day to meet targets and provide a truly competitive service that helps to maintain the company’s position as one of the market leaders. Parcelforce favour potential employees with proactive attitudes who are willing to put in additional work and effort and will thus fit in with the company’s philosophy and share the values of the existing staff. Roles available within the company range from everything from parcel sorting, delivery drivers, hub operatives, customer service agents and sales, as well as higher up, more advanced roles within management and at headquarters. Collection and delivery driving is one of the most common and available roles, and as the company and its daily parcel load continues to grow, more and more delivery and collection staff are needed, each responsible for delivering around 100 parcels per day. Their headquarters teams include human resources, finance and sales and marketing, where individuals with experience in similar roles and fields, or graduates looking to apply their knowledge and skills can thrive. Similarly, within management there are roles in different teams, such as hub management, operations management and customer service management, where staff play an integral part in the smooth running of other staff and the operations as a whole. Applicants can apply for roles within the company via their online recruitment system. The company no longer accepts paper or written applications, doing everything digitally. Vacancies can be found on their website using the vacancy search, where interested applicants can search for available jobs according to location, distance from their current postcode, occupation type, contract type and position type, as well as searching for keywords to narrow it down. There really is something for all skill-sets and levels of expertise, with occupation types including administration, driving, engineers, graduate, HR, managerial, security, technology and IT, post-person and finance. Parcelforce often advertise roles within publications, and in these cases a reference number will be included in the ad, which can then be used to directly find the job online. Parcelforce ensure that all members of staff receive adequate training before starting their job, allowing them to perform to the best of their ability and provide a level of service that is in line with their usual standard. They evaluate the abilities and skillsets of each individual employee before putting in place a training plan to prepare them for their job. This isn’t all, though. Parcelforce consistently work to help their workforce develop over the course of their time with the company with a view towards promotions and going into higher roles within the company. Their development schemes include targeted programmes such as established management development schemes and customer service training leading to NVQ’s. Along with a competitive rate of pay, several benefits are given to those employed by the company. The level of benefits depends on the individual’s role in the company, how long they have worked there and whether they work full or part time hours. Included in the Parcelforce Worldwide benefit package is annual paid holiday entitlement of four and a half weeks, as well as eight Bank Holidays. Shift and skills allowances are granted on several occasions, usually for overtime or for flexibility. They have a childcare voucher scheme to help make childcare more affordable and accessible for parents who have to work, performance related bonuses and the opportunity to join a pension scheme, to which they will make contributions. 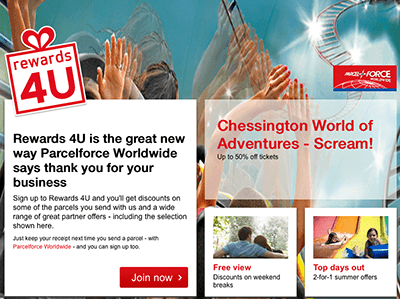 As well as these, employees can also expect to enjoy discounts and deals on leisure time and travel, as well as receiving special offers on Parcelforce and Royal Mail products. Parcelforce are also increasingly focusing on healthcare benefits and working to improve and monitor the well being of their staff. They were recently awarded The National Example of Excellence for the UnumProvident Healthy Workplaces Award for their efforts. Parcelforce can be contacted by email or phone, and also have devised a FAQ section, which contains ready made answers to many of the queries customers frequently have. Their phone number is 03448 00 44 66 and emails can be sent via their online contact form. Welsh speaking customers can call 0344 800 5550, and those with impaired hearing can call 08000 855 854. The team also deal with enquiries via Twitter, at @parcelforce, where they provide rapid personal response to customer’s tweets. Their customer service team in charge of answering calls and responding to emails are available from 8.00am – 7.00pm Monday to Friday, 8.30am – 5.00pm on Saturday and 9.00am – 5.00pm on Sundays. They do not work during public or bank holidays in the UK. Absolutlely useless. wast of time. didn’t received it. I am nit happy because I pay for the service to get it in one weeks time. its coming from South Africa cape town to London. MY TRACKING NO is cn019231791 is there any chance you can get back to me with any news about my box please. We are awaiting a parcel. The tracking service states that an attempt was made 21/12 to deliver. No delivery came to our house, we were waiting and watching and no card was left.